Would you ever deliberately and knowingly risk your dog’s health? How about his life? Would you ever gamble with it? Would you ever trust somebody to take care of your companion if you suspected they would gamble with his health or his life? The vast majority of guardians would vehemently deny ever doing anything that could possibly harm their friend. They love their furballs, they buy the best food they can afford, are responsible guardians in every aspect, ensure high quality veterinary care — and yet many of them do gamble with their dogs’ lives on a very regular basis! They do that every single time they take their pooch along for a car ride. To the park, the groomer, the vet, the dog show, the agility trial, and the obedience class or on a well deserved vacation. They gamble because their dogs are not restrained in any manner. No crate, no harness, nothing. As if the laws of physics would not apply to animals. We humans select our cars based on real or perceived safety features. We demand front and side airbags and seatbelts. The law says we must buckle up. For good reason. We all like to believe we are good drivers and that we are safe drivers. But that is not going to stop the driver running a red light, a stop sign or loosing control and crossing the median. But the gamble does not stop with the dog’s well being. An accident will turn a loose dog into a deadly missile. Endangering all passengers, even though they may be safely buckled up. Sure, most dogs enjoy their freedom in the car. Puppies and small dogs riding in the driver’s lap do look cute and they seem to enjoy the experience. Right up to that split second before the airbag explodes. We claim to have the larger brain, and we are responsible to make intelligent decisions. But all this is not just hypothetical speculation. Behind all this is the law of physics which won’t give any of us a break should we be involved in a crash. Several years ago, the German automobile club (ADAC) conducted crash tests with human and dog dummies. The purpose of these tests was to evaluate exactly what happens in an accident with unrestrained dogs. The facts are rather sobering. The test was set up to simulate a typical front-end collision at about 30-mph. Two human dummies were in the front seats, two dummy dogs loose in the back of the car. One of the dummy dogs weighed about 13 pounds, the other one about 70 pounds. What happened from the moment of impact was measured in milliseconds (one millisecond is one 1000th of a second) and took no more than 500 milliseconds to take place. After 90 milliseconds the small dog was flying at head level of the front seat passengers. At this point he was already half way to the front seats. He took off from his perch right under the rear window. The large dog was on the back seat and after those 90 milliseconds he had already crashed into the back of the driver’s seat, pressing the passenger hard into the seatbelt. After 142 milliseconds the heads of both dogs appeared above the heads of the humans. The small dog hit the head of the passenger dummy as its head was flying backwards. At 187 milliseconds the small dog smashed into the windshield, breaking it. It took another 200 milliseconds for the dogs to finally end their destructive path and come to a rest. The result? Two dead dogs and two most likely extremely seriously injured humans. The injuries to the humans were increased due to the dogs hitting the front seat and the head of the human dummy. Mostly luck that the dogs did not kill the passengers. Because at the moment of impact the dogs’ weight was multiplied by 30. Which means the small dog hit the passenger’s head with 396 pounds. The large dog hit the back of the human dummy with 2112 pounds! So far for the study. The law of physics does not differentiate between humans, dogs or grocery bags. Which means anything loose in your car will multiply its weight by 30! During a 30-mph collision a small animal in a small, unsecured crate can do just as much damage. If you use a crate and try to secure it, keep in mind whatever you use for that purpose must be able to hold the dog’s weight x 30 plus the weight of the crate x 30. When you look into a harness to secure your dog you may have to ask the manufacturer if it is designed to hold in a crash. Most of these harnesses are designed to restrict movement under normal driving conditions. Most are not sturdy enough to withstand the impact of a collision. 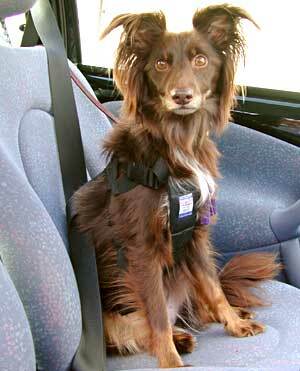 If your harness/seatbelt system is not short enough it will not prevent your dog from crashing into the front seats either. According to the study the best protection for dogs and humans are plastic crates properly secured. But there is more to keep in mind. What if you are unconscious and somebody opens the car door to help you and your unrestrained and scared dog jumps out of the car? What if you are not hurt, just rattled, open the door to view the damage and your equally rattled dog escapes before you can stop him? He could get hit by a passing car, you could be held responsible if your loose dog causes a crash or your dog could run away in his panic and you may not be able to find him. Several years ago a crash on a German highway made the news. A woman was travelling with 3 unrestrained dogs and got involved in a crash. As she opened her door to exit the car, all three dogs bolted through the door and across the busy highway. Two dogs were hit by cars and killed. The woman ran after her dogs and was also hit and killed by a car. I doubt she was thinking rationally when she tried to save her dogs. My dogs are trained to wait until I tell them to leave the car, however I would not want to take my chances with dogs who were just traumatized by a crash to remember their training when their lives depend on it the most. In January 2002 in New Brunswick, NJ a jury awarded $1.2 million to the family of a man killed in a car crash caused by a loose dog. The dog was killed too. In September 2005 a crash occurred in Great Britain. No humans were injured, but two dogs escaped from one of the cars and could not be found. Famous author Stephen King was seriously injured when hit by a car whose driver was distracted by an unrestrained dog. German law views dogs as cargo and the driver is legally responsible if his “cargo” causes damage because it was not properly restrained. Every week your local TV station is probably reporting about a rollover accident in which one or more passengers were thrown from the car and killed because they were not wearing their seat belts. There are no statistics keeping track of dogs being killed in crashes like that but an unrestrained dog would face no better end than an unrestrained human. So, why do loving, caring and responsible guardians gamble? The reasons are: he loves to run from window to window, he just loves riding in my lap, he is too big and a crate won’t fit in my car, it was just a short trip. These may all be valid reasons but won’t do a bit to protect your canine friends. Less than 500 milliseconds from happiness to tragedy at only 30 mph. 500 milliseconds from “He loves it” to heartbreaking “I wish I had….”. Drive safely and protect your furry buddies! For more articles on animals, please visit Animal World . Member of: Association of Pet Dog Trainers (APDT), National Police Canine Association (NPCA), International Working Dog Breeding Association (IWDBA). She currently works with Leading Edge Dog Training, LLC, San Antonio, TX, as a trainer.